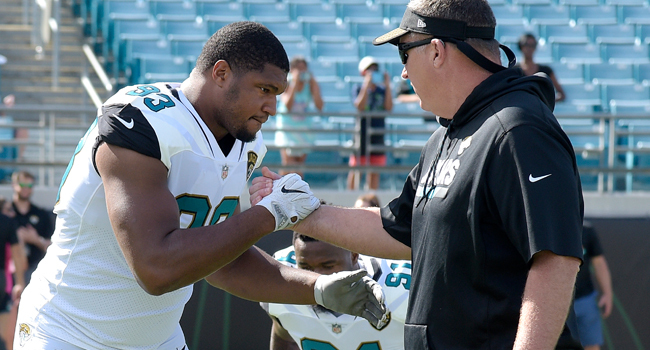 JACKSONVILLE, Fla. – Jaguars Head Coach Doug Marrone and 10th-year All-Pro DE Calais Campbell were named the AFC Coach of the Year and AFC Defensive Player of the Year, respectively, by the NFL Committee of 101 today. This marks the first time a Jaguars player or coach has received recognition from the NFL 101 Awards, which were established in 1969. Marrone, who was named head coach of the Jaguars on Jan. 9, 2017 after serving as the team’s interim head coach for the final two games of the 2016 season, finished the regular season with a 10-6 record, which was tied for the league’s biggest win/loss improvement ( 7) among first-year head coaches (tied with the Rams’ Sean McVay). In his first full season as the Jaguars head coach, Marrone led the team to a 10-6 regular season record and an AFC South Division title, which was the team’s first division title since winning the AFC Central in 1999. The Jaguars finished the 2017 season with the top-ranked rushing offense (141.4 yards per game) and the league’s best pass defense (169.0 passing yards allowed per game). The Jaguars reached the playoffs for the first time in a decade and hosted a playoff game for the first time in 18 years, defeating the Buffalo Bills, 10-3, in an AFC Wild Card matchup. Campbell, who set the Jaguars record with a career-high and AFC-leading 14.5 sacks this season, was signed as an unrestricted free agent on March 10, 2017. In 2017, Campbell served as an anchor in the Jaguars second-ranked defense, registering 67 tackles, 14.5 sacks, 14 tackles for a loss, three forced fumbles, three passes defensed and one fumble recovery, which he returned 10 yards for a touchdown. His 4.0 sacks against Houston in the season opener were a single-game franchise record and were the most in a game by an AFC defender this season. Campbell was named a Pro Bowl starter at DE, and earned first-team All-Pro recognition as an EDGE rusher and second-team recognition as interior defensive lineman. Campbell joins Tony Brackens (1999) as the only defensive ends to be named to the Pro Bowl in Jaguars history. Following each National Football League season, a civic organization called “The Committee of 101” hosts the 101 Awards, Kansas City’s Salute to Professional Football. This nationally-renowned event was initiated in 1969 by a group headed by Kansas City businessman Jack O. Wheeler to honor outstanding achievements in professional football. Each year, 101 members of the national media select the Offensive Player of the Year, Defensive Player of the Year and Coach of the Year in the American Football Conference and National Football Conference. The 48th Annual 101 Awards will be held on Feb. 24, 2018 at the Westin Crown Center Hotel in Kansas City, Mo.